64 was an important ding for me. First off, I took the opportunity to find out if anyone would still need me, or feed me. (no, I'm not old enough to remember the Beetles, I'm just a dork.) Turns out no one did, so I continued feeding myself. Second, this opened up the quests in Nagrand. I love Nagrand. Unlike every other zone in TBC, it's beautiful, and very calming to play in. There's also alot of "go kill eleventy of this and eightyteen of that, etc." quests which Multiboxers LOVE. Why? Because mobs are like butter to us. And we're.. you know... the knives or whatever... right. So anyways, Nagrand has a pile of excellent quest line, many of which end up with spectacular gear rewards. I decided not to be picky, and simply grab every quest I ran across. Even if I had to collect a ton of drops, I still did the quests. The xp was good, and the loot was better. It's Nagrand where we run into our old pal, Hemet Nesingwary, a dwarf with an itch for killing critters. We first met him in Stranglethorn Vale, where he had us hunting a wide variety of wildlife. But when TBC came out, Hemet felt it was time to level to 70, and find more challenging game in the Outlands. So he handed over his STV operations to his son, Hemet Nesingwary Jr., and setup camp in Nagrand. He once again offers us a series of Hunting quests, which are just great for multiboxers. And the best part is, that each series ends in a fight with a higher level elite, which normally stops solo questers in their tracks. But not us! I easily dispatched every mob in the entire series at level 64. It was great fun, and paid out in xp and gear upgrades. Don't miss it. 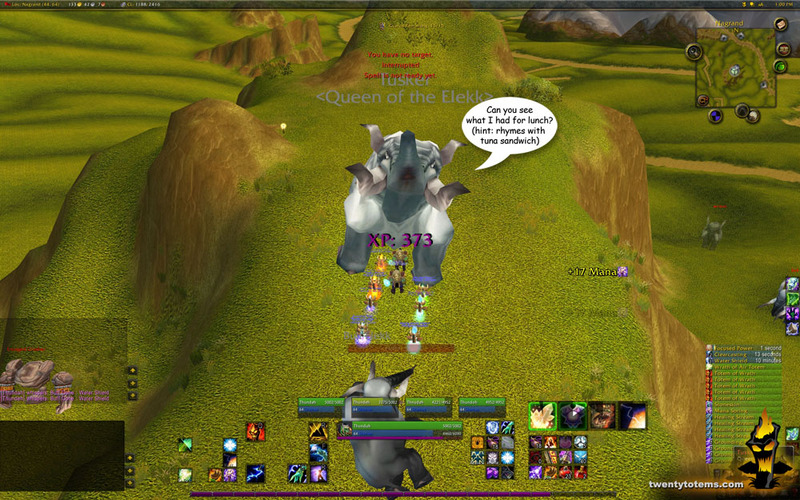 I've stated before that I'm trying not to quest too much in outland. That rule goes into effect right at this point. Once I was done with Nagrand, I started to move into instances for my xp, so as to save as many quests for 70 as possible. We have alot of initial expense at 7o, being our flying and epic flying mounts. Quest, once you hit 70, are an insanely easy way to make a pile of cash, especially as a multiboxer. We can blow through quests so quickly, and the payout is the same for all 5 toons. That adds up quick. Some quests that pay 9g before you're 70, pay out over 22g after. So it's in my best interest to save the quests for later. I chose to do Nagrand for two reasons. 1. The gear upgrades would help me get into higher level instance. 2. The quests would give me the money I needed to get my epic ground mounts. It did both just perfectly. This leaves Blade's Edge, Netherstorm and Shadowmoon Valley unmolested, and ripe for the gold digging once 70 gets here. We'll see how that works out.